Prior to joining the Rosewood team, Greg spent 30 years with M&M/MARS, in both field positions and corporate settings. Additionally, he served on as their representative on a local community hospital board. Greg found the opportunity both fascinating and beneficial in that it demonstrated the need for continuous improvement in all aspects of operations while serving people during some the best and worst moments of their lives. 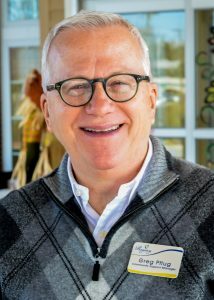 In his years with Regency Senior Living, Greg has served in numerous positions throughout the company. After relocating to Chattanooga from Charlotte, North Carolina, he served as a Community Consultant at Rosewood, where he helped families seeking to navigate the decision of Assisted Living and Memory Care. Greg then transitioned to our corporate office as our Community Support Manager, providing assistance to all the Regency communities. With this role, he gained an immense understanding of the various regulations governing Assisted Living, and allowed it him the opportunity to work with the extremely talented associates that serve their individual communities. When he isn’t serving the residents of Rosewood, Greg enjoys spending time with his wife, Julie, and sons, Tyler and Spencer. He also enjoys tennis, reading and horseback riding.